I came across a blog that has a weekly prompt for writers. 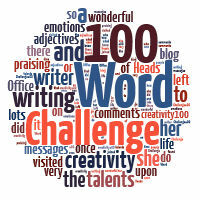 All you have to do is keep within 100 words. I thought that’s intresting and gave it a go. The prompt was ‘As the Apple fell.’ I tried to submit it to the site but all submissions are now closed. It would be a shame to wast it so please find below a very very short story. As the Apple fell, I mean thats all it took just one moment. I moved, she moved. Her hand brushed mine as we moved to catch it. Our eyes met over the Granny Smiths. Her’s green, mine steel Blue. ‘Wow your fast.’ I said as her long dark hair was falling back into place. She placed the apple in my hand and held it there. I placed my hand on hers. She caressed mine with her thumb. ‘Would you like to go for a coffee? or some fruit maybe?’ I asked. All this because the Apple fell. I would love to have a drink with you she said, then dragged out the word “but”, like she had suddenly gone into slow motion. There is always a but i said, she laughed, more like a teenage giggle really from a naughty school girl who had just been asked if she would go out with the school bully by her best mate. You see she said i am meeting my karate, teacher, Adam, Adam Zapple do you know him ? He certainly did, he knew him very well indeed. He is his sister eves farther.